My memory is notoriously good, serving me well at the bar when it comes time to remember Mike Greenwell’s career batting average (.303) or the last song on the Who’s Face Dances (“Another Tricky Day”). So as far as I can tell, the only ticket I’m missing in my collection, not including paper printouts and shows where will call just stamped my hand, comes from 2001, when I saw Stone Temple Pilots headline the Family Values tour. I had won tickets a few weeks before from a local radio station; I didn’t care about 80 percent of the bill (Staind, Linkin Park, Static X and Deadsy) and loathed that scene, but I was still a child of the ‘90s, and, at the time, still cared about STP. The CD case of either STP’s No. 4 or Shangri-la Dee Da. The former record is okay; the latter is terrible, and I don’t have either anymore. The ticket, if it was there, was likely removed before I sold them back, though. A college notebook. Each semester, I’d buy a fresh five-subject Mead notebook, a heavy duty number with a plastic cover and plenty of sturdy pockets, and that notebook would be with me for every class. I have not gone through any of those to see if the ticket was jammed in there … yet. The glove compartment of my Saturn. That car is long gone, so let’s hope it wasn’t there. If and when I find it, I’ll let you know. The spoils of Christmas were, once again, kind. I was certainly fortunate enough to always experience a great Christmas as a kid. Whether it was Transformers, baseball cards or CDs, I was lucky enough to walk away from the day happy and entertained. I’m older now, and the gifts are more restrained and subtle. But I like that, and this year, my favorite gift was a ticket stub album, with acid-free pages and sleeves designed to store and display tickets from whatever. 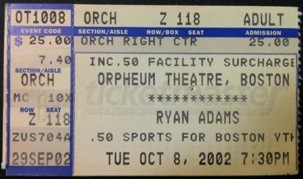 I’ve saved nearly every ticket I’ve ever held, be it for concerts, baseball games or otherwise. But their organization has been scattershot. I’ve stuck them in record sleeves, picture frames and binders, all purposefully placed but never in a way that would make sense to a second brain. This album, then, was a gift and a two-part exercise. The obvious, latter half would be sorting and organizing the tickets, getting them into the pages and remembering each concert as I went. The first half took a bit longer — actually going through envelops, frames and all the other nooks I’d stuck tickets through the years. But I live for those kind of menial exercises, so it was no trouble. Some tickets resonated more than others. Some brought back vague, hazy memories, others rushed me back into my seat or my spot on the floor and filled my head with real-time amplified binges of sound in my head, without aid of a bootleg recording or a DVD. The birth of this site, Static and Feedback, nearly coincides with the halfway point in my concert-going life (2000 to today). 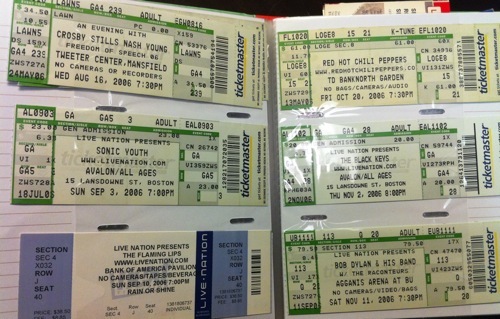 So I pulled some notable, pre-2005 tickets out of the book to provide a series of highlights, in chronological order. 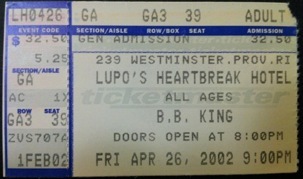 I spent my 20th birthday on the floor of the original Lupo’s club, just a few feet away from the man himself. King, then 76 years old, was still a showman despite playing from a chair. And there were more than a few reminders of his age; at one point in the set, he started talking about the troubles of aging in a grandfatherly tone, casually mentioning medications and aches and pains. It was kind of a downer, quickly brought back up by a self-deprecating jab at his Burger King commercials from a few years before. None of that, however, could take away from watching a master still playing music at a high level. King had a solid band behind him and was still able to punctuate his lyrics with tough, tight blues runs. A night to remember, for sure. The Who reside in a near-untouchable perch in my life, sitting comfortably alongside the likes of the Beatles and Pearl Jam. Finally seeing the band, even in the wake of bass player John Entwistle’s recent death, was a event of the highest order. I sat for three months in frenzied anticipation of this show, listening to every record endlessly, as many bootlegs as I could get my hands on, reading about the band in every book I could find. The show was the climax of band worship. Aided by a light rain, the initial blast of Pete Townshend’s guitar through the venue’s speakers shook my hooded sweatshirt. It was a baptism. If the Who was an experience in the realm of loud rock and roll as power, Ryan Adams was a sharp reminder that there can be power in the absence of volume. Aided by his guitars, acoustic and electric, the piano and occasionally a mic’ed floorboard for some foot-stomping percussion, Adams whirled through his songs with both humor and quiet restraint. The most vivid memory of this show, though, comes as the lights went down. Nearly black with minimal stage lighting, Adams sat down and quietly picked his way through “Tomorrow,” written with the help of Carrie Hamilton, who had been lost to cancer earlier in the year. Adams voice on the Demolition recording is beautiful. Live, it was haunting. 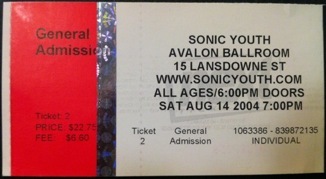 Sonic Youth was originally part of the aborted Lollapalooza tour that was to include the likes of the Pixies and Wilco. With that cancelled, Sonic Youth scheduled an early night at the Avalon which would serve as my first experience with the band. I was expecting a good night of good music. Sonic Nurse had come out a couple of months before and was a study in how to make great, exciting music after more than two decades as a band. I was not expecting to be blown away, nearly literally, from the first song through. During “Paper Cup Exit,” the band stopped on a dime, halting all sounds instantly while cutting the lights to the building. It took everyone’s breath away. With every show I’ve been to, I’ve been patiently waiting for a band to conjure up a sound, or the precise absence of sound, to rival that moment. The Wang Theatre is a century-old building built for operas and symphonies, its domed, guilded ceiling serving to whip the sound up and back down onto the back of the balcony, creating amplification without distortion. It was from the back of the balcony that I saw Wilco for the second time, on tour for A Ghost Is Born and playing a set that leaned heavily on that record and Yankee Hotel Foxtrot. The highlight, though, came from 1999’s Summerteeth. “Via Chicago,” starting simply with Jeff Tweedy’s voice and an acoustic guitar, grew into a cacophony of screaming guitars, drums and keys, thundering and rattling the delicate old building. 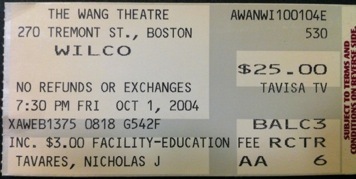 That night, as I do most nights, I tucked the ticket into the back of my notebook, put the book in my pocket, and got on the T to head home. Sometimes it’s my car. Sometimes, if I’m lucky, I can walk home. But the ticket is always tucked away in my wallet or my notebook, bundled with scribbles and eventually memories. Now, those tickets are gathered as a tome, mapping out the journey of my concert-going life. I’m glad I have them, and I’m glad I now get to share them.